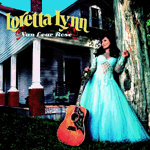 Music Review: Loretta Lynn's "Van Lear Rose"
Loretta Lynn being one of country music’s reigning queens, it’s safe to say that her 2004 album Van Lear Rose will have its share of gems, and it’s in the reviewer’s best interest to get to all of the songs in short order. But getting past the first and eponymous track is no easy business. Here’s why. It’s a good story, for one; most of Lynn’s songs are. “Van Lear Rose” describes a bit of family backstory that’s obvious but delightful in a “Tell it again, Daddy,” sort of way. And. Lynn’s voice is way up in the mix so that you’d swear, if you kept your eyes closed and finished your drink, that you were sitting right next to the stage. Plus. Lynn’s got a knack for easing up on the throttle, quieting things down for a verse, and allowing the consonants and glottals of the lyrics do their own work: she sort of both talks and sings as the band hushes up for a bit, and that’s such a consummate storyteller’s moment that you might as well be watching Mark Twain (or one of his imitators) slap the stage with the ball of his foot, adjust his white jacket with both hands and a shrug, and rogueishly harrumph. You can see Lynn sing this song. She’s either just behind or just ahead of the beat, and you suspect that she’s a little bit off this way because she’s busy bouncing up and down in front of the mic, the hem of her gingham dress in her fist, swaying fro and fro and to. Then there’s “Portland, Oregon”, a sly account of a too-short night in that eponymous, incredible clean city, and let me tell you that this contains one of the biggest hooks this side of a New Pornographers tune. When Lynn and Jack White spiel out the “uh-huhs” on their way to the bridge, with all of the emphasis on the “huh” part, it’s like a gigantic two-finger come hither which you are powerless to resist. A big ol’ Come on. A monster Grab my hand and let’s get to the dance floor right now, Hot Stuff. What’s that? Oh yeah, Jack White? Of The White Stripes? Did I not mention? He produces the whole album. That I don’t mention him until now says a lot, I suppose, given that White duets with Lynn on that second track and basically does a bang-up job as a slide guitarist, backup singer, and console-minder. Even so, there’s no question whose show this is. There’s precedent for this kind of something-old, something-new partnership; the most recent and famous touchstone would be Rick Rubin’s work with Johnny Cash in the nineties and with Neil Diamond in 2005. Rubin’s M.O. was mainly to strip down his musicians’ sound until they felt vulnerable, barren, and human; in the process he himself garnered this not-totally-undeserved reputation as a canny student of his older, greater collaborators, and pretty soon that was what you heard more than you heard the music itself: “Rubin really gets these guys, you know? He like really understands them.” You know? Here it’s not like that. White makes Lynn feel so young: every song has a ramshackle immediacy that turns out to be a sorta-new way of thinking about adding records to living legends’ discographies. Why do the bare-bones “O Death” routine when you can do what “Have Mercy” does, “Have Mercy” being a dirty blues that depends on a pounded-out triplet figure before seguing into this jazzy bass vamp that’ll make you shimmy? Or “High On the Mountaintop”, which is is a footstomping hootenanny that sounds like a guest-singer outtake from Springsteen’s Seeger Sessions? If Jack White needed any more kudos, well, here they are. Not every song will register the way the aforementioned songs will and do. But that doesn’t mean the record lags toward its end. After the racounteurish “Little Red Shoes” and the frowny “God Makes No Mistakes,” it’s on to the slow inferno of “Women’s Prison” and the this-truck-ain’t-got-no-brakes of “Mrs. Leroy Brown.” Somewhere, Jim Croce’s cracking a wry smile. And he’s not easy to get to smile, Jim Croce. Jim Croce being, well, passed on from this earth. But you know who's very much alive, don't you. Loretta Lynn. After listening to this record twice or thrice, I read that Lynn turned 71 back in April. 71. I believed it not. Neither should you. McPhee's song "My Destiny": The thousand monkeys who wrote this song are blowing doobie-smoke at the screen, hooting and throwing their green visors in the air. Gad, what a terrible song. Randy's right: it's not totally her fault. But gad. Taylor's not leaving anything for the trip back. Ever see Gattaca? One brother to the other: "How were you able to beat me? How did you manage to swim back?" (Genetically-flawed Ethan Hawke and his genetically-perfect brother would swim out into the ocean until one tired, and therefore lost). "I never saved anything for the swim back," sez Ethan. And Simon's awarding of "rounds" (McPhee takes this round? WTF?) is to Idol what Crossfire was to meaningful debate: needless oversimplification. Yes, Katharine McPhee: I also like Chet Baker's Embraceable You, and the solemnly-picked acoustic guitar accompaniment is working well. Here's the thing. You admire McPhee. But Taylor Hicks thrills you. Why Taylor's going to win: that velvet jacket. My buddy JBG has one, and while he pulls it off, Taylor pulls it off. and their general inadequacy become painfully apparent. How can I place a photo in this blog's upper right corner? I.e. so it is outside of the Post window, and is a regular fixture of the upper frame? Anybody able to help is entreated to do so. By me. Got this neat little Julius Caesar thing going after my haircut this afternoon. Lots of talk about the Best / Most Influential Books of the Past 25 Years. The New York Times as usual seeks to and does locate itself at the center of an invented yet important discussion. Beloved by Toni Morrison wins. Opinions? For my part, I have no qualms with Beloved's victory. I'd have loved it, but been surprised, if Don DeLillo had won out. He's one of my boys, no question, one of our very best, but I think he'd be more liable to win on this site than in any Times survey. The list of judges is long and distinguished, and that more than anything else means that I can't take any issue over the result. But while I have no qualms with the survey itself, I think that there's a great deal more to say which books were chosen and why, and what books were omitted and why, and what that means about the art. I wouldn't consider anything that received a vote to be very cutting-edge or experimental. There's a conservative bent to any discussion in which your task is to ID the "best" of something, maybe. I dunno: I guess I'm more prone to digging on that work which risks. I'm not hating on Beloved or any of the books on this list. But I miss me some Corrections with its incredible scene of talking poo; I miss me some Mark Z. Danielewski circa House of Leaves; I miss me some inestimable IJ. Even Nicholson Baker's stuff (The Mezzanine, say, and know that I'm excluding Vox entirely) would rate a mention in my list. There's a thrift shop in the basement of this church in Skaneateles; it contains the most ornate, lovely old cash register you have ever seen. When I paid for my porcelain cup and three CD's ($3.25 plus NYS tax), the woman helping me said "Don't leave: I have to give you your 2 cents. I am so going to give you your 2 cents!" She did. She's wins today's Best Person Ever award. 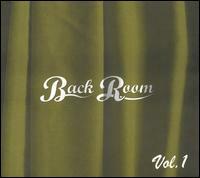 Various Artists, The Back Room Vol. 1. This is on Kinkysweet Records. And the liner notes, while brief, are as overwrought as you might expect on a CD that bills itself as dance music for, well, the (ahem) mysterious (wakka-chikka wakka-chikka) back room that is supposedly a staple at high-end clubs. But no: those are my fantasies leaking through. "Whether it's a t home, in our cars, at a bar with friends, at home with closer friends, or poolside, sipping a Mojito; we love the sound of dance and electronic music..." Well, cool. Not lurid, but cool. And oh yeah the music. The music's alright. A decent compilation, I suppose, but nothing really distinguishes itself. 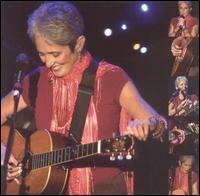 Joan Baez, Bowery Songs. A live set from '04. Beethoven, Violin Concerto in D, Op. 61 / Romance No. 1 in G, Op. 40 / Romance No. 2 in F, Op. 50. Perf. 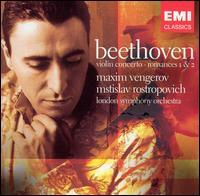 Maxim Vengerov (violin) w/ the London Symphony Orchestra (Mstislav Rostropovich conducting). Beirut, Gulag Orkestar. This disc is something else. The thematic and lyrical content, as well as the sound of the record, makes you think of the Reichstag on fire. Make no mistake: it's indie pop. But it waltzes. For those of you who will get the references, imagine Rufus Wainwright joining the Decemberists circa, say, "The Mariner's Revenge Song" from Picaresque. Beirut, who is a rather young boy, nails both Wainwright's popera vocal style and the Decemberists' quirky instrumentation. Mandolins and brass sections both make prominent contributions. For those on whom these references are lost, let me try another: you know that scene before the big final battle in Saving Private Ryan? The young translator's sitting around with Ed Burns and some other troops, and they're reminiscing about their lives as an old phonograph echoes in the background right before the Nazi half-tracks rattle into earshot? This record sounds as if those troops had had the chance to start a band. It's that kind of wounded and beautiful. It's highly stylized, very baroque, and completely captivating. I could also reference Antony and the Johnsons as well as the cut-up cabaret of the Dresden Dolls, both bands that seem to be looking over the same sepia war photographs that seem to haunt this Beirut character, but I'd rather just go ahead and play this disc again. Sam. I christen it the Reigning Top Disc of Recently Acquired records. 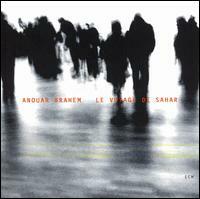 Anouar Brahem, Le Voyage De Sahar. The oud is an Arabic lute. Anouar Brahem uses it to play jazz. 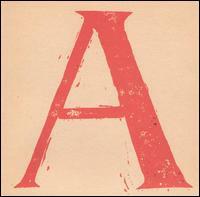 Makes a great twofer with Beirut's Gulag Orkestar. 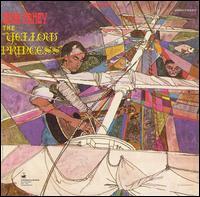 John Fahey, The Yellow Princess. M. Ward fawns over this record in the liner notes. You'll see why by the time you get to track 3, "Lion." An analogy: John Fahey is to the steel string guitar as Art Tatum is to the jazz piano: you'll swear that multiple people are playing at once. You'll be wrong. Some of the fastest most overwhelming instrumental folk guitar you will ever hear. This came out in '69. Where has it been all my life? 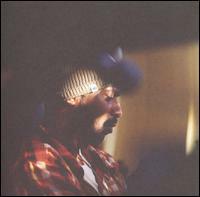 Madlib, Beat Kondukta Vols 1 & 2. Supposedly a soundtrack to a never-made film. Instrumental hip-hop with excellent samples (Sam Cooke among them). And, as I was driving home late last night, I was pretty sure I heard some sort of 8-bit Nintendo sample skittering along. Cass McCombs, A. Cass McCombs hails from Baltimore. (Thanks, EmC!) He's a singer-songwriter for the times, which is to say that you can't be sure if he's serious or not. Pitchfork hits on this issue quite well. It's sweet, gritty, muddled, and melodic. The production's lo-fi and charming, and tries to sound serious but not too. The adjective "slack" should also get some play in this capsule. It is slack. Let's call it slack-rock. There's more to be said about this later, I suspect. Highlight? The final track, "My Master", which goes on and on and on about how YOUR master's in there talking to CASS'S master, and maybe that means Cass is in trouble, and Cass already had enough to worry about. 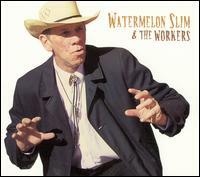 Watermelon Slim & the Workers, Watermelon Slim & the Workers. Watermelon Slim drove a truck for most of his life. Watermelon Slim had a near-death experience recently and has been singing the blues ever since. Watermelon Slim holds degrees, like me, from the University of Oregon. Watermelon Slim rode shotgun in the devil's Cadillac. Watermelon Slim, rumor has it, is a member of MENSA. Watermelon Slim, as you can see here, is out to getcha.